This article attempts several experiments with tomato stressing that this not only is reddish and beautiful to look at but is very tasty to eat and is filled with several healthy elements which are essentially beneficial for health and beauty enhancement. It acts as iron covering against various diseases which have been detailed hereunder. Apart from the vitamin ‘C’ in ample measure in tomato, the other elements present in it are potassium, calcium, sodium, iron, calcium, folic acid, carbohydrates, citric acid, thymine, riboflavin etc. Mix 3 gm of black pepper in the 100 gm of tomato juice and drink it both during the morning and evening times to get rid from anaemia ( Lack of blood). Blood augments by taking the carrot and tomato juice also. The blisters of mouth cures by gargling the tomato juice mixed with fresh water. Regular use of tomato prevents us from the diseases that surface up due to lack of vitamin ‘C’ chief amongst which scurvy. The patient of scurvy becomes weak and irritating. His gum bleeds and there is shortage of blood in his body. According to the Doctors, one tomato is far more packed with power of natural elements in it than an apple or an orange. It is enormously helpful for the diabetic patients and for the obese people for reducing their body weight. It’s most beneficial when eaten in raw state without being cooked. It prevents from pimples, turns the skin shiny, useful in kidney related ailments, purifies blood, , increase enhance height in the growing children and acts as safeguards against, eye, liver, heart and stomach diseases. 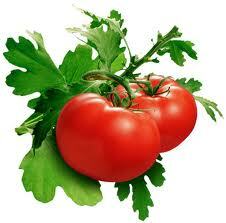 The vitamins found in tomato has this speciality unlike others that its vitamins do not get destroyed on cooking. This is why Doctors advice patients wit weakness to eat raw tomato, vegetables cooked with it and tomato juice. Drink a glass of tomato juice with a pinch of salt and black pepper as per your tastes daily in the morning for a month and your skin complexion will become fairer, constipation will disappear for good, the fire of hunger will increase, and skin will become softer. Take the juice of tomato, carrot and beetroot in the evening for three months and see your checks getting red, pimples and blots removed from your face, and wrinkles would not fall on your facial skin. Drinking tomato juice before meals ignites the fire of hunger and complexion become fairer. If the pregnant woman will eat 2 raw tomatoes daily, her child’s complexion will be fairer. Cook two big ripened tomatoes on burner, sliver it from its mid section, put into the space some salt with black pepper and feed your child for 5 days. The worms and germs from his stomach will be completely destroyed. Feed the nascent child of 3 months one teaspoonful of tomato juice daily and gradually increase its quantity. Teething problem will get considerably minimised. If 4-5 tomatoes are taken daily, the daily requirements of vitamin’ A’ of the body will be fulfilled from this, In every 100 gm of tomatoes are gotten 385 I.U. vitamins. The persons from fever should drink tomato juice. It brings in strengths in the body and makes up for each required elements of the body during the fever. Lip rupture problem is cured by eating tomatoes which often chap during the winters and a layer solidifies over them. Tomatoes should be eaten in abundance. The person often suffering from vesicles of mouth and tongue should eat tomato. Tomatoes act as medicine for vesicles of mouth. Constipated people should eat tomatoes. It’s is always better to eat ripe tomatoes than the raw and greener ones. Apply the mix of pulp and juice of tomato, papaya, and the orange on your face. Spread its layer uniformly all over the face. Let it dry. Wash it with cold water afterwards. This mask turns the skin soft, refurbishes it, and extracts out the dirt from shin pores. Prepare the paste of juices of tomato, carrot, milk and almond anf apply it on the face and around the neck as face pack. The skin becomes spotless from blots and spots. In order to wash the oily skin properly, take a spoonful of tomato juice, and mix honey into it. Apply this mix daily on your face the cut out tomat pieces in circular motionover and over neck and wash it afterwards. This good for oily skin and a very good face pack too. Apply a liquid of a teaspoonful of tomato juice mixed with a few drops of lemon juice on your face to open up the clogged up skin pores of your facial skin. Boil a big spoonful of tomato juice with the equal quantity of cucumber juice and drop some lemon juice also into it. After its cooling, mix a spoonful of boric acid Apply this face pack over your face for 15-20 minutes. Use this process once a week. Mix turmeric powder in the tomato pulp and apply it on face to get the shinning skin. Dandruff vanishes by applying jaggery mixed with tomato juice over the head and the hair. Rotate in circular motion the cut out tomato pieces over your face to open the skin pores. Mix tomato juice, pumpkin juice and cucumber juice and apply this liquid over your face with a cotton swab to get a shiny skin. It will prevent skin wrinkles. You can also use tomato juice and milk in equal quantities. Prepare a paste of tomato juice with bran and apply it as face pack to get a shiny skin of the face. Prepare a thick paste from 1 spoon of tomato juice, ½ spoon of lemon juice, a pinch of turmeric, a little of gram floor (besan). Apply it around your eyes to minimise the black circles.